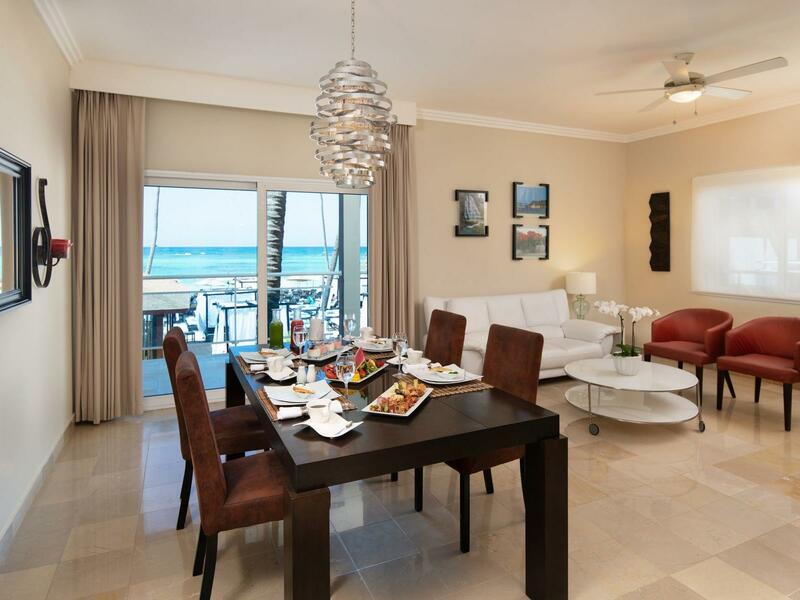 Presidential Suites Punta Cana features one, two, and three bedroom suites in six individual buildings with elevator access. Each suite is luxuriously appointed with fashionable furnishings in the separate living area and stainless steel appliances in the kitchen with refrigerator, microwave, coffeemaker, glass and tableware. All of our indulgent suites offer air conditioning, dining room with table and chairs, and a balcony or terrace perfectly situated to appreciate the tropical ocean, pool, or garden views. Our luxurious One Bedroom Suites feature a king bed and full bath with combination shower/tub. Maximum occupancy is three adults. Our spacious Two Bedroom Suites feature a master suite with king bed and a second bedroom offering two twin size beds. The second bathroom is shared, located off of the living area. Maximum occupancy is five adults. Our indulgent Three Bedroom Suites feature a master suite with king bed and two additional bedrooms offering two twin beds each. The second bathroom is shared, located off of the living area. Maximum occupancy is seven adults.